Musical Investigations - episode 2: Bernstein "A Big Indian and a Little Indian"
I really, really love this second episode of my "Musical Investigations" series not only because the music in question is absolutely hilarious, but also because I had a major lightbulb moment when I found the solution to my own problem. The excerpt in question is from Leonard Bernstein's, "A Big Indian and a Little Indian" which is the fourth song in his adorable, clever song cycle, I Hate Music. There are several things about this song that initially freaked me out. It's "con brio" which always makes me nervous because it usually means "fast." It has multiple meter changes - 7/8, 8/8, 9/8, 3/8, you-name-it/8. There may as well not be any time signatures half the time because Bernstein seems to disregard them anyway in terms of phrasing and groupings of notes. The right hand and left hand don't line up in terms of where the stresses are. The left hand is stressed at the beginning of every three notes and the right hand is constantly changing making the whole passage a bit like patting your head and rubbing your tummy. 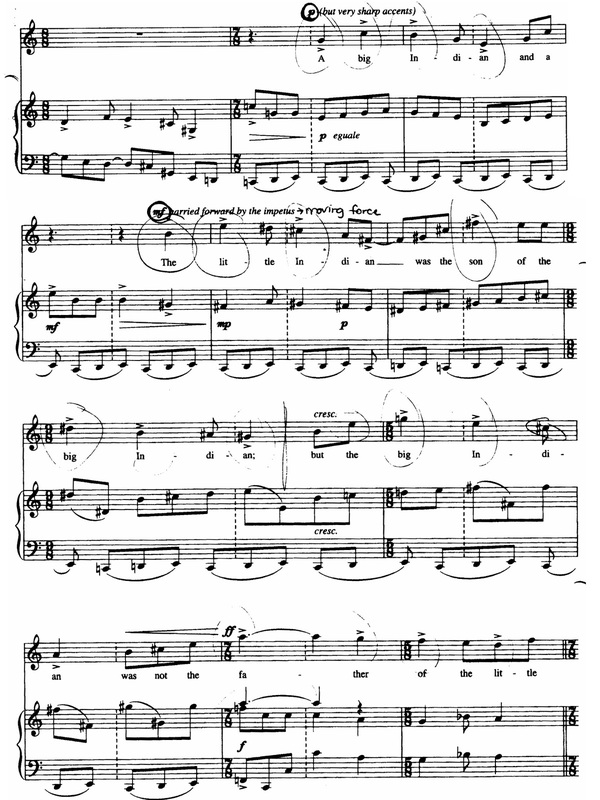 There are accents, especially in the voice part, and in meters like those listed above, accents can have a way of making the pianist feel like he/she is in the wrong place in the music. On a positive note, the idea behind the song is hilarious. It's a little kid telling a riddle, complete with several bars of vamping while the singer is waiting for the audience to solve the riddle. I love it! So how not to freak out? How could I see this music in a simplified way so that my brain and hands didn't freeze up? a sequence starting at the beginning of the third line) involving an octave and ascending step-wise pattern that starts on D# then moves up to E, F#, G#, and finally to A. Not so bad when I looked at it that way. To put it all together I first worked on the right hand, using the patterns I had discovered to learn the part in a way that kept my mind engaged. Then I looked at the left hand part and set up the vamped pattern, playing it over and over again until I felt like I was in a groove and didn't need to put any thought into it. Once in that groove, I added the right hand in, trying not to see every individual note but instead seeing the patterns with a relaxed mind and relaxed hands. After a few times under tempo, I got it. I understood it. It made complete sense and I realized that I didn't even have to pay attention to any of the meter changes. What was the best part of having figured this piece out? I could actually listen to the riddle and laugh right along with the audience. I think Lenny would have approved! I'm always up for a challenge. Usually this is a good thing and one that energizes me since I know that on the other side, especially if it is somewhat successful, I usually rediscover a new world of confidence and inspiration and am more motivated to take on even greater challenges. But sometimes, as was the case a few weeks ago, the challenge ends up being more daunting than I had imagined and that, quite simply, is not much fun at all. Listen to recordings of the concertos a lot, following along with the score and marking in which instruments in the orchestra play which lines. Identify which musical lines are actually heard when played by an orchestra. Eliminate anything in the music that can't be heard in recordings. Mark in the music what I wanted to leave out and what I felt was crucial to play. 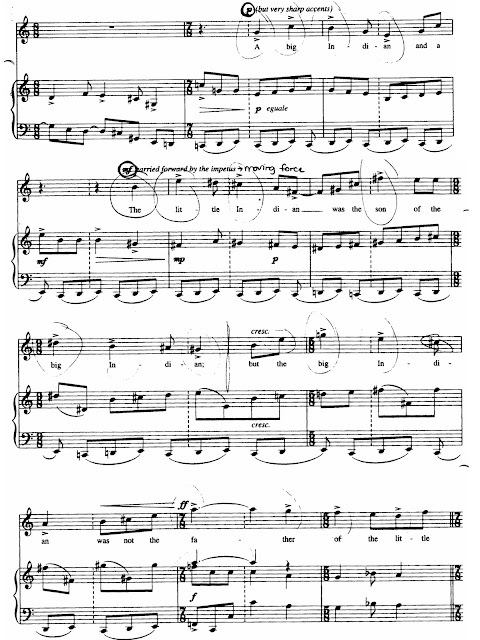 Mark the tricky passages that would require my attention whenever I sat down at the piano. Schedule time to practice every day that I do practice. Spend a portion of time every day playing through the movements in their entirety up to tempo to get a feel for where I am, to practice playing with a focus on musical intent, and to practice accepting imperfection. 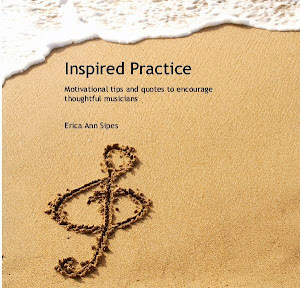 Sing the flute part along with the orchestra part from the get-go, focusing primarily on rhythm and articulation at first and then expanding to include pitches. Conduct through everything while listening the recording and while hearing it in my head. Stay as calm and cool as possible. This all seemed to work pretty well until I found myself on the day before the masterclass. I knew I wasn't doing well when my husband kept looking at me and saying, "Wow, I've never seen you look like this before. You're really struggling." Ugh. He was so right. I felt unprepared, frustrated that I wouldn't be playing the music with the soloists until right before the masterclass, and nervous to play for someone as famous as Galway. A big fan of cognitive psychology I tried to talk myself through my fears but I kept sinking back into worry. That night, after I received a phone call from one of the flutists, saying that he wouldn't be in town until an hour before the class, I decided that I had to do something different to calm my nerves - I was going to crack otherwise. So what did I do? Facebook. Yup, Facebook. And I don't even like Facebook so that tells you how desperate I was. I looked up the flutist on Facebook in hopes that I could at least see what he looked like. Strange, huh? But it worked! I saw his face, found a link to his personal website and learned quite a bit about him. As I was listening to some video clips he had of his playing I suddenly realized that I was breathing again, I think because I was reminded that music-making is about people, about sharing music, about communicating. It's not about all the tiny notes on the page and whether or not we hit them all, it's about the music. It's not about impressing someone famous who might not even want to be impressed. And then I remembered why it is I like accompanying, even in difficult situations. I like to counteract the nerves that another person feels, to figure out ways to usher them through stressful times in a graceful way and to hopefully give them a chance to enjoy the music and performing. That night I slept just fine. Yes, I still worried about the bit orchestral tuttis that have entirely too many notes in them and yes, I worried about whether or not I could keep track of the flutists' parts, but I had finally found my way back to myself. And when I'm myself, I'm a pretty decent pianist and a supportive accompanist. And when I'm myself I have no problem walking onto a stage. If you have any experiences with extreme performing that you'd like to share, please feel free to do so in the comments. We can all learn from one another when it comes to dealing with nerves! Music can be so many different things. It can be entertainment. It can be worshipful. It can be impressive. It can be inspiring. And for me, at least, music can also be healing - it has been ever since I was a little girl. But today I witnessed the healing side of music taken to a new level - music was used not only to heal but to also serve as a cautionary tale about what can happen when a young person is routinely ostracized, ridiculed, and bullied. In the case of Destini, the young girl this song was written about, the tragic result was suicide. 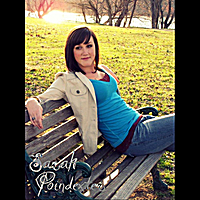 Sarah Poindexter is the composer and performer of the song, "Dear Angel" and she performed her song today at her senior voice recital at Radford University, singing and playing at the piano on a darkly lit stage in front of her classmates, friends, and family. The song itself is powerful in its rawness and honesty and to see this young woman singing it by herself was like witnessing a private dialogue that she was having within herself, full of doubt, regret, sorrow, but also love. Such sentiment expressed publicly through music can be uncomfortable to absorb but I also think that songs like this have the power to teach some powerful lessons that can be hard to make stick. It is not easy to write music for me personally. This song took about four years to actually finish, but if I didn't have that time I wouldn't have been able to tell the story in such a moving way. I believe that there was a higher power working with me to tell this story. Destini's story deserves to be told and hopefully it will prevent future events like this from occurring. She was very misunderstood, which is not necessarily accepted in most high school settings these days. Every day she was made fun of for one thing or another, yet she always asked me how I was doing, greeted me with a smile, and was very complimentary any time she heard me sing. While she was different, she was one of the most caring people I knew. Even after her death, her life still seemed to be a joke to people. Where ever Destini is, I want her to know that there were people that cared about her and didn't want to see her go, inspiring the song, "Dear Angel." And here are the lyrics to the entire song. Please do read them. It was a cold, winter morning when the phone woke me. I heard a voice that was familiar; it was so shaky. She said, "Will you pray for the family?" I wondered what was wrong. I just knew that she was gone. where not a tear was shed. How could they be so careless? Do they know why she's dead? because of what we all said. Dear Angel, can you hear me? that you meant nothing, but you do. staring at your empty chair. Altogether having fun; but we missed one. smiling in your white cap and gown. I know you're where you are supposed to be. 'cause I'm singing this song to you. for all we put you through. to prove to you we miss you. I am moved by Sarah's bravery in getting up on stage and performing a piece of hers that is so intensely powerful. I am thankful to have been in the audience to hear this song performed in such an intimate way. I'm also proud of the music faculty at Radford University for seeing the need for one of their students to perform a work that might not normally find its way into a graduation voice recital. And as a mom of a little girl myself, I want to say how important it is that we, as parents, make sure that bullying is not a part of childrens' lives. If we see our own children engaged in this tempting behavior, it is our responsibility to teach them that it is a dangerous and cruel game and that it is not acceptable. If we see our own children being bullied, we need to make sure that we step in and change their world to make it a safer place to be. "Dear Angel" is available many places online - click here for a link to her song on cdbaby. Her song is labelled as being "explicit," most likely because it is about suicide but I've listened to it many times and aside from the topic, there is nothing that I find offensive or inappropriate about the song. It is a testimony. It is an apology. It is a love song, all rolled up in one. Thank you, Sarah, for your song and for being willing to share these words with all of us. I've blogged about this before and I'm going to blog about this again because I can't stop thinking about it. I am not afraid of the word. Yes, sometimes I am a collaborator and when I am, I am proud of that role as well. I love the discussion that can happen between myself and other musicians I'm working with - what does the composer mean here? How can we make this transition work better? What tempo feels right for this section? And performing as a collaborator gives me a sense of even more freedom than usual when I perform. I feel like I can let go and sing the music, seeking a wordless and magical level of communication with my colleagues in the moment. But there is also something so deeply satisfying about slipping into my accompanist role, stepping into a different set of shoes that enables me to sense who I'm playing with at a completely different level. When I accompany I don't necessarily seek a lot of give-and-take with whomever I'm working with because sometimes the situation doesn't really call for it. Perhaps I'm working with a 5 year old cellist who is performing for the first time in his or her entire life. Or an autistic child that has a difficult time communicating in a very personal way but music brings him or her one step closer. Or it could be someone that's been playing for a while but that is simply not as comfortable in a performance situation. Then there are times like this morning, when I had 15 minutes to rehearse with a flutist I had never met before, playing a piece I had only received two weeks ago in preparation for playing it for James Galway in a masterclass. This was a very skilled musician but we were working in a bit of an extreme situation. In my mind, these simply aren't times to expect or seek much of a collaboration. These are the times when I enjoy claiming my title as accompanist, as one who walks beside another as a companion. I strive to make such experiences as smooth, musical, and enjoyable as possible, constantly trying to sense whether or not a tempo is working for a performer, giving him or her room when I can tell they are struggling with nerves or with memory, nudging them musically when they seem to be losing steam or inspiration. It's a very giving experience and one that gives me great pleasure, especially when I sense that my giving allows the person with whom I'm working to feel at ease and more likely to be positive about the performing experience. It is a giving experience that pays me back in indescribable ways, and I'm not talking about money. I think there are some that might wonder why I continue to play for Suzuki book recitals - why I continue to "accompany" when I could be "collaborating" all the time. It's simple, really. I love being able to perform in situations in which I'm not nervous about the repertoire I'm having to play - it allows me to reconnect with my instrument and to enjoy making beautiful sounds within the context of doable music. I love supporting and encouraging young musicians. I love the look of gratitude and pride on parents' faces after hearing their little ones communicate in a brand new way. I love it all, from beginning to end. And every so often, when the accompanying turns into collaborating for a given musician at a given moment, it's the best of all possible worlds. It's worth a whole lot more than money in my book. And it's a great honor. So yes, I am an accompanist and proud of it.